Naples attraction-guides.com - Naples, Italy attractions guide Naples Mount Vesuvius volcano information about attractions, Herculaneum, Stabiae, eruption, lava, volcanic soil, landmark, location and address, general tourist information about Mount Vesuvius volcano in Naples (Napoli) area, Italy (Italia) IT - Last updated 30/10/2012. 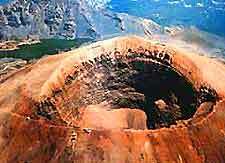 Although the Mount Vesuvius volcano, to the east of Naples, has gained a destructive reputation, Mount Vesuvius is actually quite small for a volcano, and stands at only 1,270 metres / 4,200 feet. The residents of nearby Pompeii, Herculaneum and Stabiae did not even realise that it was a volcano, until it started rumbling and finally erupted, causing much destruction to the area in 79 AD. Although the actual eruption of Mount Vesuvius did not include much lava, there was a considerable amount of mud, cinders and ash. Herculaneum was completely buried under mud, whilst nearby Pompeii and Stabiae vanished under black ash. Naples and most of Italy were also coated with a thin layer of dust from the Mount Vesuvius eruption. Today, the rich, fertile volcanic soil on Mount Vesuvius grows grapes and olives in abundance . Mount Vesuvius is within easy reach of Naples and the area around the volcano has become one of the most densely populated in Italy. Mount Vesuvius was last heard from in 1944, when a tiny eruption left some visible lava flows and sealed the main fissure, preventing the smoke, that was once a familiar landmark, escaping from the top of Mount Vesuvius.